Home » Our Doctors » Andrea Joseph, O.D. 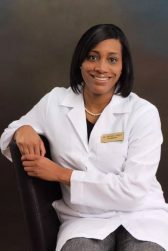 Dr. Andrea Joseph graduated from the University of Delaware with a Bachelor of Arts and received her Doctor of Optometry degree from the Pennsylvania College of Optometry. She’s been in practice for six years and her specialties include Pediatrics and Binocular Vision. When Dr. Joseph asked what made her specialize in her field, she said: “I worked with the pediatric population in college and really enjoyed it.” She says she loves helping patients to see more clearly so they can better enjoy their preferred activities. In her free time, Dr. Joseph enjoys traveling, swimming and crafts as well as volunteer work and mentoring students.